Alif the Unseen is a book unlike any other I've ever read. It is the story of Alif, an internet service provider / hacker, living in an unspecified City, in an unspecified Emirate, somewhere in the Arabian Peninsula. To begin with, it's just a tale of nerd-has-girl-trouble: his girlfriend is leaving him to marry another man. She tells him she never wants to see him again, never wants to hear from him again. In a fit of angry despair, Alif decides to make her wish come true, and write a programme which can identify her, no matter which computer in the world she uses, and make his own email address, web handles, avatars, phone numbers etc. forever invisible and unreachable for her. Only after some manic coding does he realise that this programme in the wrong hands could be a terrible weapon against any activists. Soon, things get a little out of hand. Before we know it, the story involves an ancient mythical manuscript, people who seem supernatural (djinn!) and sinister state security forces / persecution. The book is not flawless. For this particular reader, there is something uncomfortable about the way Islam is infused in the mix, especially in the later parts, and how faith in Islam is promoted. I'm never going to enjoy a book where anything is driven away by the power of Faith / God, Islamic or otherwise, but that aside, it's not really fun to detect an author's pet subject / propaganda sneaking into a novel that's otherwise an adventure story. That aside, buy this book! It's hard to beat in terms of entertainment value: beautifully written, no hint of purple prose, thrilling, and full of the magic of Arabian Nights and the techy dazzle of teh interwebs, in an exotic combination you've never encountered before. A stunning debut novel, brilliant despite a small handful of preachy moments, and unusually current and topical. 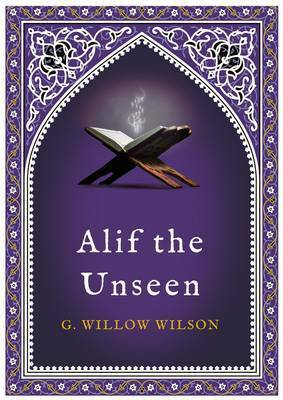 For another great review of this book, see Sheenagh Pugh's review of Alif the Unseen.